We all know that social media doesn’t always tell the full story. Fitness bloggers often post their incredible results but rarely show how deceptive those Insta pics can be. This only makes us that much more grateful for fitness bloggers like Finnish vegan Sara Puhto. 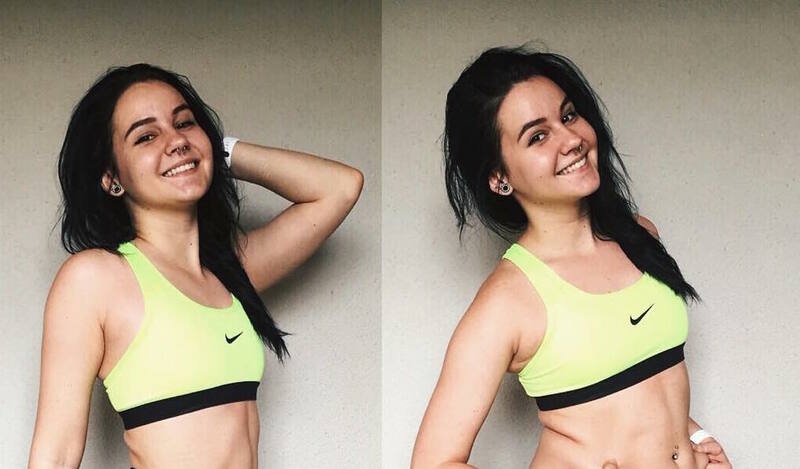 Not only does this fab, fit Instagrammer give us the real deal when it comes to “body” pictures, but she’s also made a habit of showing us that you don’t have to starve yourself to be fit. In her latest post, this awesome lady is disproving one of the most misleading ideas on social media today — that before and after pictures have to be taken months a part with noticeable, obvious progress. Wrong! Bodies in pictures can be deceiving! Just see for yourself in Puhto’s “transformation” pic below! These photos were taken a few seconds apart!! Who doesn’t compare every now and then? While having positive body image is very important, it’s natural to see the way bodies are portrayed in the media and want to look and feel better. However, some photos don’t tell the whole story, as Puhto goes on to explain. "I'm pretty sure everyone has bad body image days. I woke up this morning, looked at myself and thought I looked a bit fluffy today, usually I'd go about my day and end up posting the photo on the left and say how I'm feeling fluffy and bloated today, when the truth is the right photo shows my true fluffiness (no flexing and full tummy relaxed). So I thought I'd do a brutally honest post and show you my true fluff "
These pictures don’t lie. It’s refreshing to see a woman speak the truth in regards to her body and the way it isn’t always just so, including Puhto’s. "What I'm trying to say is bodies fluctuate daily, even hourly. Don't beat yourself up if you have a bad day, week or month. Everyone has bad days. Everyone has some % of body fat. And everyone's body looks different from different angles/poses whether they're flexed, relaxed or bloated." This is so true! There are days you’ll wake feeling like the healthiest person alive and others, all you want are the stretch pants with the elastic waistband. Our bodies evolve through each day and there’s nothing wrong with that! "People will post their highlights and their hard work on Instagram so don't compare yourself to them! You're beautiful no matter what  This is honestly really terrifying for me to post, so please don't be too harsh. I just hope this helps some of you if you're having a bad day." She’s absolutely right — you ARE beautiful no matter what, so don’t let the next fitspiration blogger’s “before and after” get you down. After all, they’re only human, too! Even they have fluctuating body days.